We are happy to announce that the "Leads by GigMasters" app is now available for Android! 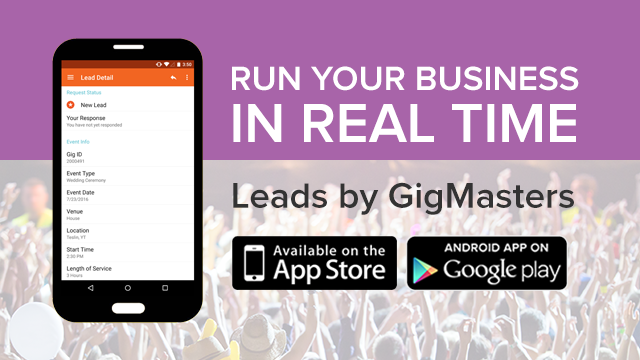 GigMasters' new mobile app allows event professionals to run their businesses in real time, by completely automating the lead management process. With this app, you can receive leads and send quotes more quickly and seamlessly than ever before. Apple iOS version updated too! If you have an iPhone (or any other iOS device) GigMasters has updated the app with some exciting new features, such as the ability to launch maps from the gig location field. And you can now view the Lead Detail while you compose your quote! Let us know what you think, and don't worry...be APPY!